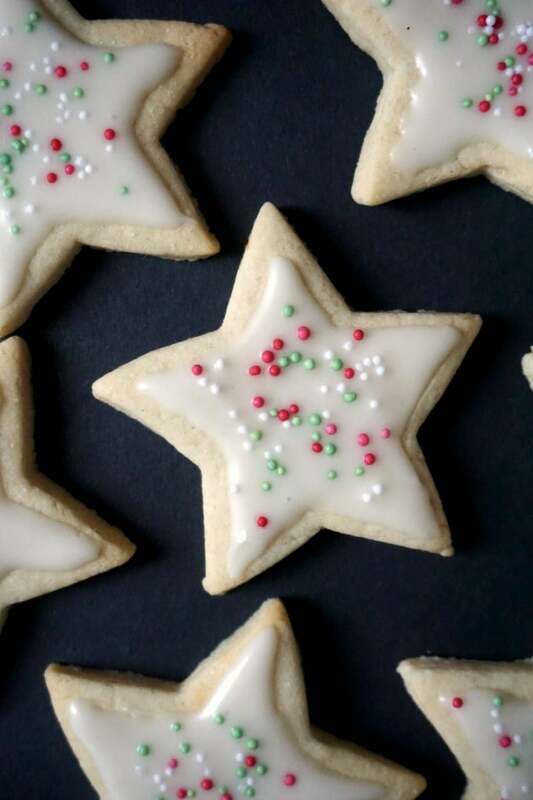 Get into the festive spirit with these beautifully flavoured Christmas Iced Sugar Cookies, a star-shaped sweet treat for kids and grown-ups alike. Great as homemade edible gifts for families and friends. Have you started your Christmas baking yet? I am trying to put up a list with all the goodies I’m planning to bake, and it’s already looking very exciting. I have some recipes like my Snowman Cupcakes Recipe or Reindeer Cupcakes that I know are really nice, but more are on the way. You might think it’s too early still, but time flies, so better be prepared. Actually, for me the festive season is on once we celebreate Saint Nicholas on the 6th of December. It might not be a wide-spread tradition, but it is surely as nice as the Santa one. It is said that Saint Nicholas is an old man that no one has ever seen, and, every year on the 6th of December, he comes in at night to leave presents for all the children that have behaved during the year. Unlike Father Christmas who comes in through the chimney, Saint Nicholas comes in through the key hole. The presents are left in/next to the boots, so the evening before, all kids have to polish their boots to make them nice and shiny for Saint Nicholas. In you have been naughty, chances are you might find a stick in your boots, otherwise expect some presents, usually fruit, chocolates and toys. I can’t tell how excited I was as a child to get my boots ready. And what a joy the day after when I was up in the morning to find my boots filled with goodies. I still keep this tradition on for my little ones, and it’s so nice to see them as happy as I was as a child. So, Saint Nicholas has already left us some presents, now it’s time we thought of Christmas. 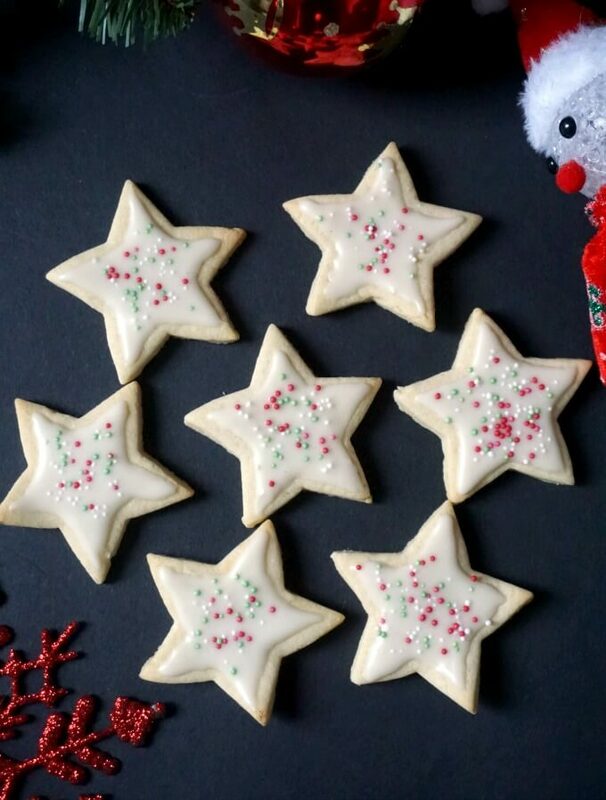 These Christmas iced sugar cookies are not only yummy, but also really fun to make. And very easy too. Just a few simple ingredients: butter, geanulated sugar, plain flour, eggs, a bit of vanilla extract (or any other of your choice) to bring even more flavour, a bit of kneading, a bit of chilling, oven on, and ta-daah, some pretty little stars. The dough is really easy to work with, it doesn’t stick to the hands or work surface as all, just use a bit of flour if it does, and that usually sorts out the problem. It’s as easy to use as the dough I made for the Gingerbread men, but of course, a totally different one. 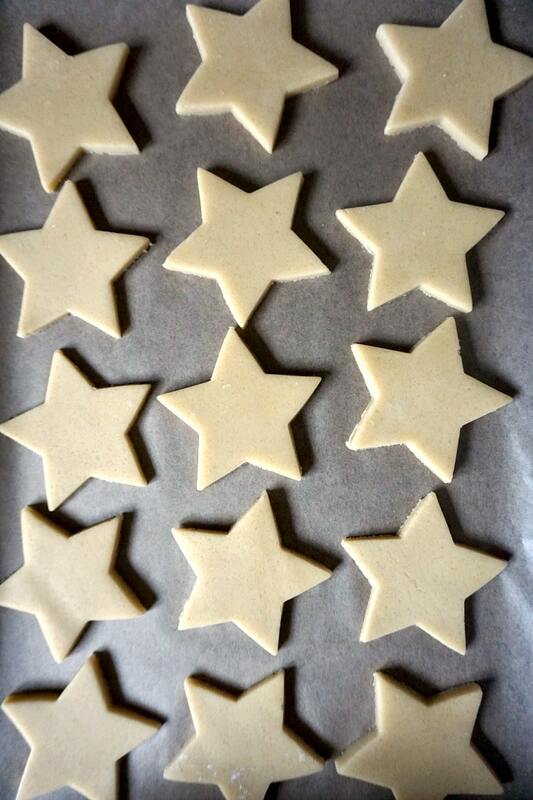 Use any shape you like, it doesn’t have to be stars, but make sure they are pretty much the same size so they can bake at the same time evenly. Most ssupermarkets will sell cookie shapes, especially at this time of the year. A few tips here: the oven must be well pre-heated before you pop them in. The amounts listed below are enough for 30 cookies, so l had to arrange them onto 2 baking trays. Don’t get both trays in at the same time, better one by one to ensure an even bake. Depending on the size on your cookies, they should take 10-12 minutes to bake, but make sure to check them after 8 minutes. If you take them out of the oven before 10 minutes, they will be softer, but if you want a good crunch, leave them for 12 minutes. The colour should still be a pale yellow, so don’t leave them any longer than that, or the edges will burn. You might need to get the second batch out sooner, since the oven is really hot by now, but do keep an eye on them. This must be the easiest icing to make. It doesn’t need any butter or cream cheese, as it usually requires for cupcakes, but only icing/confectioner’s sugar and milk (full fat one!!! ), and a bit of vanilla extract for flavour. No need for corn syrup either. 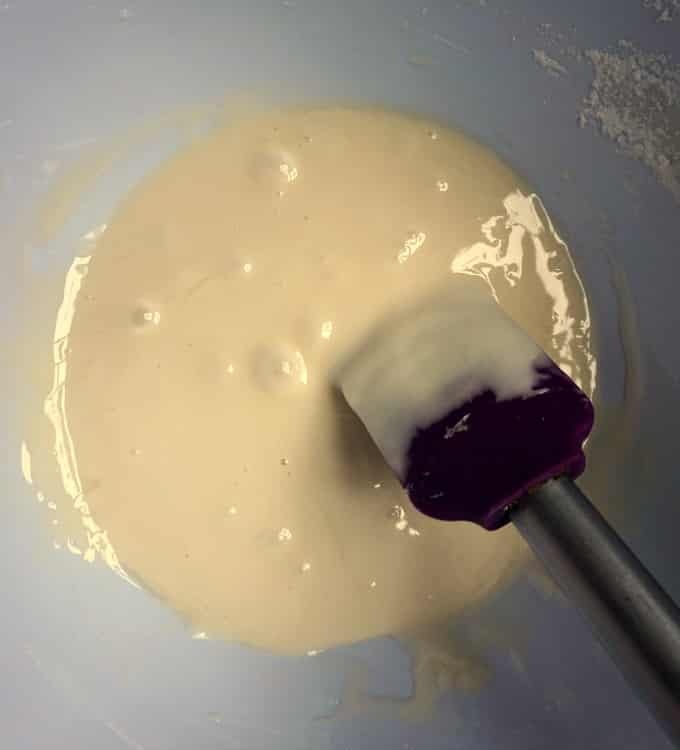 If you choose to make the icing in different colours, add the food colouring paste with the other ingredients and mix well. Try to avoid liquid food colouring, it’s not as good as the paste one. The icing is really shiny and easy to spread, but once it’s on the cookies, it hardens, so best to put the sprinkles on straight after, otherwise they won’t stick. You can, of course, leave them without sprinkles, that’s absolutely fine. Just the icing should do. I used a piping bag with a really small round nozzle, and that did a great job at spreading the icing. Now, the icing might not be spread quite perfectly well, l have dead hands when it comes to decorating and using precision. I usually need to try a few times before l can make a straight line. Ha, you should have seen me in school when l had my Maths classes, Good Lord, my hands were always shaking. It didn’t help at all that l was also shy, all the teacher had to do was look at me to get my hands shake. Anyway, l did try my best with these cookies, l think in the end they don’t look as bad as l thought they would. So, l’m kind of happy with the result. Give these easy cut out cookies a try, they are super douper yummy. And possibly, the best frosted sugar cookie recipe in the world. Just don’t have too make, they are sugary. Well the name itself says it all, so moderation is the key to a happy life! 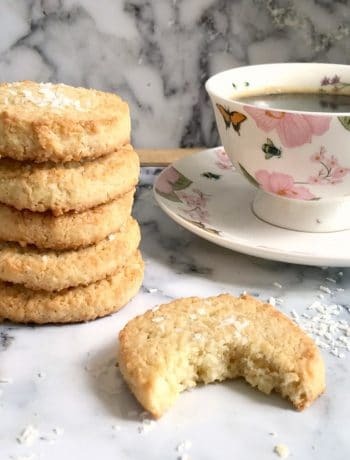 If you’ve liked my CHRISTMAS ICED SUGAR COOKIES or any other recipe on the blog then don’t forget to rate the recipe and let me know how you got on in the comments below, I love hearing from you! You can also FOLLOW ME on FACEBOOK, and PINTEREST to see more delicious food and what I’m getting up to. 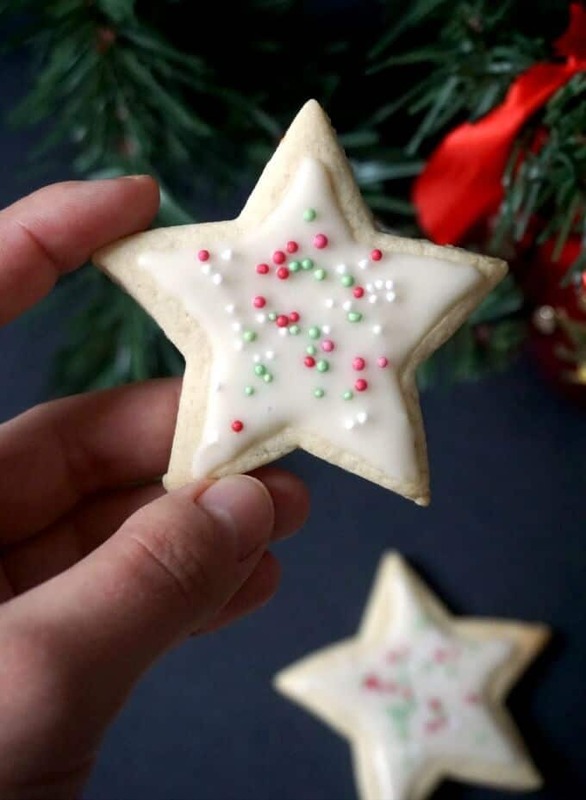 Christmas Iced Sugar Cookies, a start-shaped sweet treat for kids and grown up alike. 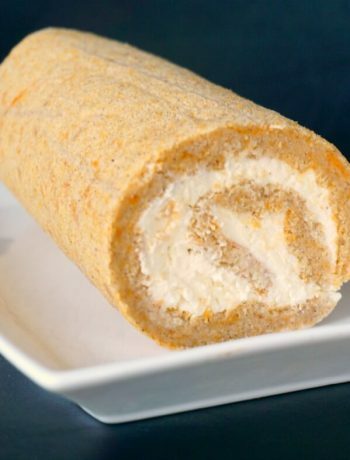 Super easy to make, and super yummy. To make the dough, mix together the butter and sugar, then add the egg and mix to get a smooth paste. Add the flour and vanilla extract and knead well to get an elastic dough. Transfer the dough to the work surface, and use a rolling pin to roll it out. 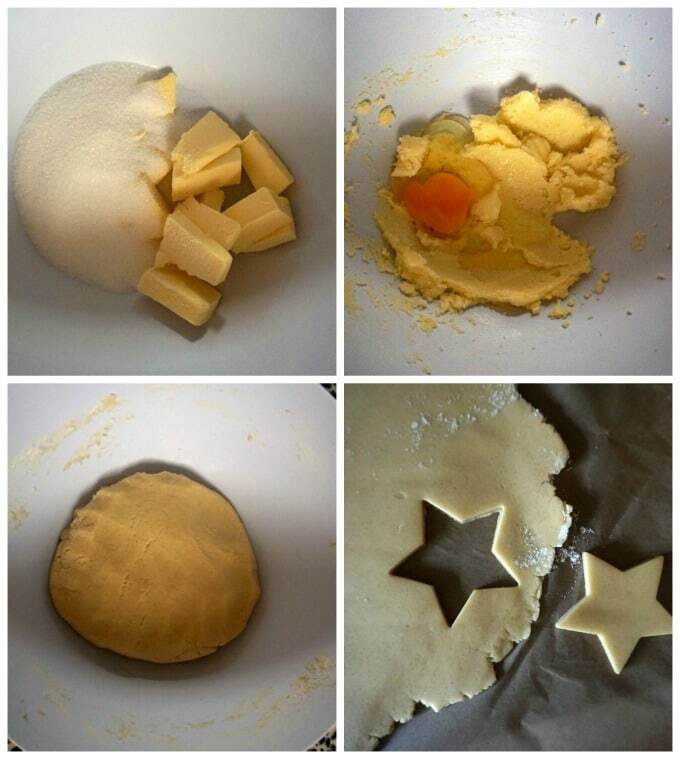 Use star-shaped cookie cutters to shape 30 stars. Arrange onto 2 baking trays lined with baking paper, cover the trays with clingfilm, then chill in the fridge for one hour. Bake the cookies one tray at the time for 10-12 minutes, they will still have a pale yelow colour, but will be firm to touch. Arrange on a plate and leave to cool completely. To make the icing, sift the sugar, add the milk and vanilla extract and mix well to get a smooth paste. Fill a piping bag with the icing sugar, and using a small round nozzle, ice every cookie, then sprinke the hundreds and thousands. 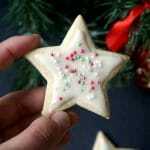 I just found the US Customary Link for this sugar cookie recipe. Thank you for including this helpful link, it will be a great time-saver!!! It’s one teaspoon, however you can add more if you like, it won’t change the texture, just adds more flavour.